There has been some discussion about the possibility of Delta ordering Bombardier CRJ1000 NextGen jets and placing them in service though a regional airline. Currently there is no Delta CRJ1000 jet, as Delta Air Lines has not ordered the CRJ1000 regional jet. Delta currently owns Bombardier CRJ900 jets as apart of their fleet. On December 6, 2012 they ordered 40 more CRJ900 NextGen jets. There can be some confusion that Delta operates the CRJ1000 NextGen because they own other CRJ series aircraft, including the CRJ900. 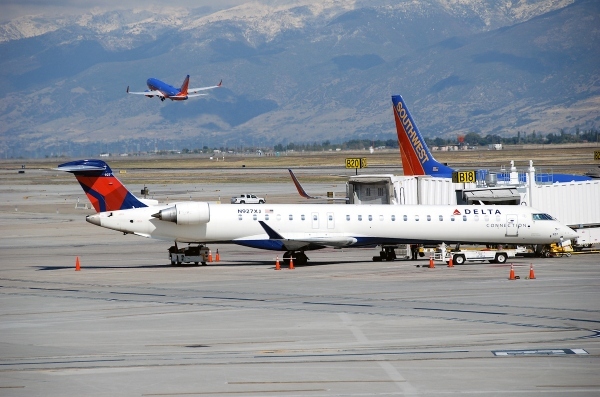 Currently Delta Air Lines does not operate or own any Bombardier CRJ1000 NextGen jets. To learn about the other CRJ series aircraft that Delta owns or operates check out the Delta CRJ900 NextGen page or the Delta CRJ700 pages. Above Delta Connection CRJ900 jet photo (Not a Delta CRJ1000) by Aero Icarus on Flickr. Photo (only) released under a Creative Commons License. The following is a list of the other names for the Bombardier CRJ1000 Delta: also called the Bombardier CRJ1000 NextGen Delta, Bombardier CL-600-2E25 Delta, Canadair CL-600-2E25 Delta, Bombardier CRJX Delta, Bombardier CRK Delta, Canadair Regional Jet 1000 Delta or the Bombardier CRJ 1000 Delta / CRJ-1000 Delta (with a space or a dash).